Yamunotri Dham Yatra Ex Haridwar | Char Dham Yatra "धर्मो रक्षति रक्षितः"
Early morning drive to Hanuman Chatti, from here you have to take local jeeps for Janki chatti (It helps to reduce the trek upto 8 kms), trek start from here to Yamunotri Temple. (6kms). Either by walk or by horse or by Doli. After Yamunotri arrival do Pooja Archana at the temple and drive back to Barkot. Early morning drive back to Haridwar from Barkot. Early morning drive to Barkot vai Dehradun capital of Uttarakhand and Mussoorie, queen of the hills. One way you can see the enchanting view of Kempty falls. The huge Garhwal Himalayan ranges starts from there. Evening arrive at Barkot.Overnight stay at pre booked hotel. On the way visit Dehradun, Mussoorie and Kempty Fall. Later drive straight to Barkot. Check in pre booked hotel night stay at Barkot. Early morning drive to Hanuman Chatti, from here you have to take local jeeps for Janki chatti (It helps to reduce the trek upto 8 kms), trek start from here to Yamunotri Temple. (6kms). Either by walk or by horse or by Doli. After Yamunotri arrival do Pooja Archana at the temple and drive back to Barkot.Overnight stay at Barkot. 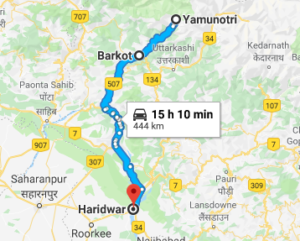 Transportation from Haridwar to Char Dham and back to Haridwar.